Howard Johnson Calgary Calgary, Hotel Canada. Limited Time Offer! The hotel isRead more located in the south-east section of Calgary, at 5307 MCLEOD TRAIL S.W., only 10 minutes by car from the city center.This Calgary hotel is of a Budget category and is a two star . 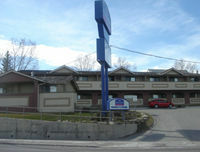 You will find several amenities such as : Free Parking.With a 50 room capacity with categories ranging from the Room to the Room) rooms, the Howard Johnson Calgary is accessible starting at 112 US Dollars.It is part of the hotel chain HJ.This hotel offers a unique service : wheelchair accessible.This hotel offers high speed internet.Practical information:This hotel has a free parking.